Seen your first butterfly yet? 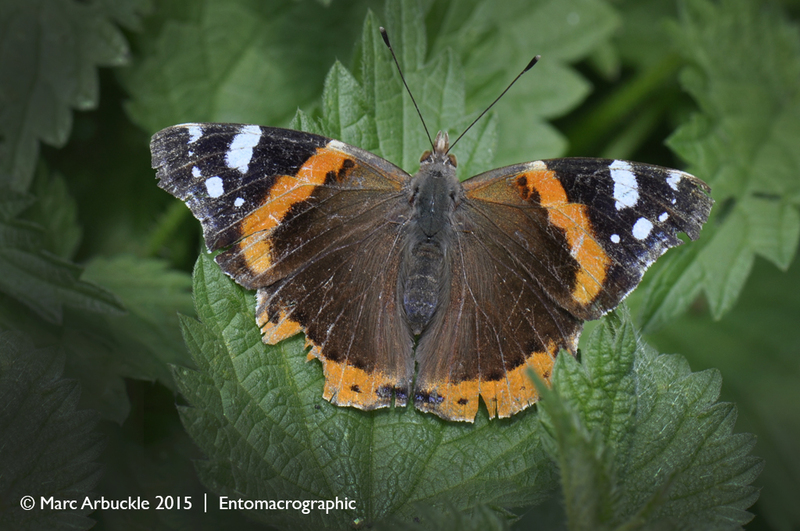 As I left the office for lunch the other day (Wednesday 28 January) I saw my first butterfly of 2015, a rather tatty Red Admiral Vanessa atalanta similar to this one I photographed last year. This took me by surprise momentarily as it was quite a cold day. It was fluttering around inside the glass canopy that covers the Holly-lined pathway that leads to the entrance of the building and that I suspect was the reason. The combination of the low winter sun and the shelter from the icy wind had warmed it sufficiently to have woken it from its slumber. The Red Admiral is predominantly a summer migrant that most often arrives in the UK in May and June but a small population do overwinter in the south of Britain and therefore this butterfly is also considered a resident. Unfortunately this hibernation strategy is a risk as many individuals will not survive our winter unless conditions are mild. However, global warming may help it to become more firmly established as a resident species in the future. Have you seen your first butterfly of 2015 yet? Nice, Mark! I haven’t seen one yet this year. Bet it won’t be long now! As I look out my window and see the snow whipping around as another foot gets dumped on us, I can only wryly smile at your question, Marc. But I’m glad the insect world over there is ahead of the game here! The long hard winter may necessitate some cheating on my part, a.k.a. a trip to the butterfly conservatory. Yes I don’t envy you that snow. Here when the sun shines the first hover flies are beginning to show. Not that you’d notice today. It’s cold, grey and foggy again. I haven’t seen any up close but from a distance I’ve seen what might be painted ladies and some unknown yellow and white guys. The land of butterflies … Texas. Yes over 400 species I believe. How lucky are you. We have just 59 in the UK and only 44 in Wiltshire. But you have some of the real beauties. I -love- your blog. Nice post Marc. I am waiting with interest to see how our Red Admirals have fared over the winter. You are not that far from me, so I am seeing your sighting as a good omen. Outdoors I have seen just one Comma so far when we had a couple of freak warm days. Yes I enjoyed your recent post ‘Interesting things you can do with a butterfly’. I think as long as we don’t get a prolonged cold or wet period their gamble may pay off. The freak warm days do seem to be waking things up quite early this year. I’ve heard reports of people seeing tortoiseshell, brimstone, comma and a few species of hover fly and honey bee. Hello Colin, no problem. I have a friend Steve who is the county recorder for Odonata. Maybe he should come too! I think everything counts if you want it to.